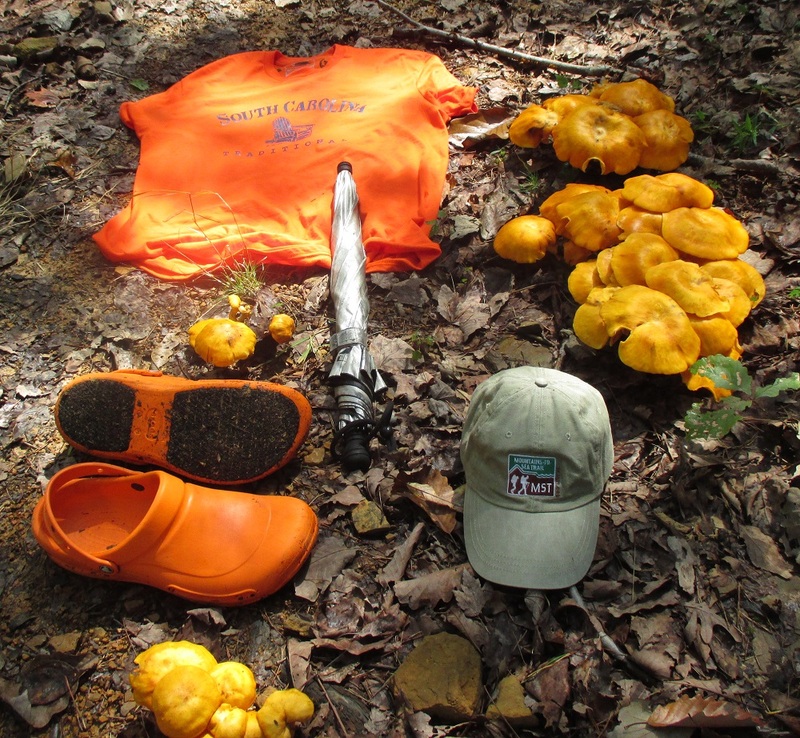 Hat, Shirt and Crocs number four with a Longleaf Pine seedling planted early this year next to the Pinhoti Trail on Taylor's Ridge - it's a major effort to re-establish this special species at the far NW edge of its range. Longleaf Pine is a species I became intimately familiar with when I moved to coastal North Carolina. The Coastal Crescent section of NC's Mountains-to-Sea Trail passes through many fire-dependent savannas in which old Longleaf prevail. Here's a prime example from Holly Shelter Gameland - a stand that had recently undergone a controlled burn. I had just crossed into the northernmost range of a mountain variety of Longleaf. The US Forest Service is making a major effort to restore Longleaf, a historically important species that had been heavily over-harvested to produce pitch to waterproof wooden ships. The production of this tar is why North Carolina came to be called the Tar Heel State. 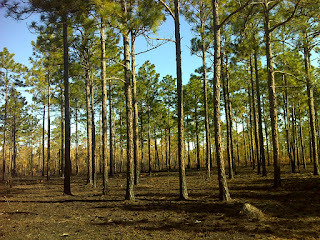 That industry faded with the industrial age, but was replaced by other threats to Longleaf: increased efforts at fire suppression, the general clearing for agriculture, harvesting for timber, and replacement of Longleaf by the faster growing Slash and Loblolly pines as the cash timber crops of choice. 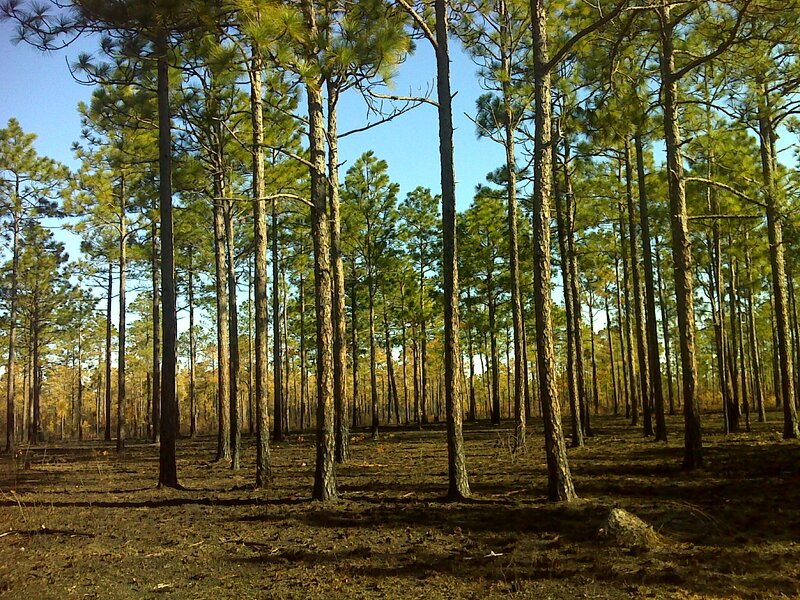 The result is that Longleaf now occupies less than 3% of its original range. I was excited to see this project in its early stages. The trees were planted in winter 2015 roughly ten feet apart over hundreds of acres. The clearing provided me with fine views. I always love hiking under the open sky. As this photo shows, it was a cloudy day. I got a late start because of lingering morning rain that day and also the day before because of the same storm system. So I hiked only 21 miles over these two days, and am combining them into one report. The section I hiked covered the northern half of Taylors Ridge from US 27, the walk along and beside Narrows Picnic Road, and the climb over another ridge from there to East Armuchee Road. It was nice to have the varied scenery. There wasn't any overall theme to the sights along the way, but as is evident from the content of the headline photo, I'm creating a theme. Hat number four was a chance find along the Mountains-to-Sea trail in North Carolina, Shirt number four proclaims my current ambitions, and crocs number four are one of several pairs of RealTree branded camo-crocs that I've bought because they seemed to fit better than others. These have been my work-horse pair of hiking shoes, but now they will just become part of the rotation - I've found that the newer Crocs have a more consistent size, so most styles now fit me perfectly in the same nominal size. This shirt is a recent bargain purchase made at a truck stop on my drive from Topsail Beach to Dalton. The hat was purchased to support the Friends of the Mountains to Sea Trail, and the Crocs are one of two orange Mario Batali signature 'Crocs for Work' that I have, and I'm likely to buy more as others wear out because I love these for hiking. They have a tough non-slip tread and have no vent holes so that dew and mud can't get to my feet as easily as they do with regular crocs. Also in the photo are a cluster of matching mushrooms and the Go-Lite umbrella that I carry when rain threatens. Okay, enough about gear. Mushrooms were out in force because of the recent rains. I saw a trlue blue one, and another that was textured in an interesting way, especially on the stem. Okay, now you may want to hide the kids' eyes. The next pic shows a little bit of risqué action, box turtle style. I've never seen box turtles mate before. It seems nearly an impossible feat. The male (they always have more orange/yellow coloration than the female) has stretched his hind legs beyond what seems believable. And I suspect that other parts need to have similar capabilities for extension (ahem). I took my photo and left them to their business. And that's about everything fit to print today. Below, as usual is a map of the route hiked with links to quite a few more photos of admittedly lesser note. But hey - much of the time the weather was dreary.